Home CDN , children , crafts , feature , February , holiday , holidays , homeschool , papercrafts , printables , US , worldwide February 11th - Featuring Thomas Edison Freebies! February 11th - Featuring Thomas Edison Freebies! -- Thomas Alva Edison (February 11, 1847 – October 18, 1931) was an American inventor, scientist, and businessman who developed many devices which greatly influenced life around the world, including the phonograph, the motion picture camera, and a long-lasting, practical electric light bulb. -- This bold reassessment of Edison's life and career answers this and many other important questions while telling the story of how he came upon his most famous inventions as a young man and spent the remainder of his long life trying to conjure similar success. We also meet his partners and competitors, presidents and entertainers, his close friend Henry Ford, the wives who competed with his work for his attention, and the children who tried to thrive in his shadow — all providing a fuller view of Edison's life and times than has ever been offered before. The Wizard of Menlo Park reveals not only how Edison worked, but how he managed his own fame, becoming the first great celebrity of the modern age. • The Boyhood of Thomas Edison -- Filmed on location at Edison's childhood home in Milan, Ohio, and at his famous laboratory in New Jersey, this program dramatizes some of the youthful experiences which helped to shape the life of one of America's great practical scientists and inventors. Part of the Boyhood Series, which chronicles the early lives and times of some of America's most fascinating citizens. Format: DVD. - As Valentine's Day approaches, some single folks would like to point out they are quite content buying candy and flowers for no one but themselves. - Nothing is quite as refreshing as a piece of peppermint patty candy, right? The mixture of melt-in-your-mouth chocolate over a refreshingly cool concoction of peppermint simply explodes in the mouth! Peppermint patties have been around for years. In 1940, the York Cone Company manufactured the patties in York, Pennsylvania. According to the website, the patties were such a hit, the company's other products were discontinued in order to produce more of the patties. 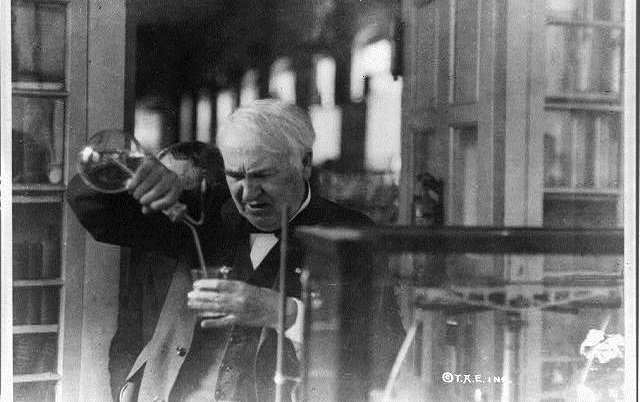 - A day to honor the birth of Thomas Alva Edison and recognize his electrical inventions, including the lightbulb. It is also the day to discover our own body electricity. - Celebrates the men and women who participated in a strike at General Motors in 1937. These auto workers helped the United Auto Workers (UAW) union to become the sole bargaining agent for General Motors autoworkers. As part of the symbolism of this strike, everyone wears a white shirt or blouse. - A great opportunity to meet someone new, or do something to make a new friend. Making a new friend can be easier to do than you think. There must be a gazillion ways to make new friends. It often helps by smiling and just being friendly or helpful. Spend today just being friendly, and doing special or nice things for others. - This national day of observance will give polite recognition to nearly a half million active and retired sports wives throughout the country for their public service in the estimated $213 billion professional sports industry. Unknown to the public, pro sports wives are the household managers and silent partners who keep their favorite athletes motivated, focused and determined to win and create the feeling of being a winner within us all. - In recognition of the enormous contribution inventors make to the nation and the world, the Congress, pursuant to Senate Joint Resolution 140 (Public Law 97 - 198), has designated February 11, the anniversary of the birth of the inventor Thomas Alva Edison, who held over 1,000 patents, as National Inventors' Day. - It simply means don't worry and stress over the little things. Enjoy life to its fullest and savor each and every day with an optimistic attitude and a smile on your face! It's a day to think positive, look on the bright side, and to find something good in everything that happens. - If you know anyone who can't get out of the house for whatever reason, go visit them – bring groceries, grab a paper, bring him or her a houseplant, or just have a sit-down and a chat!